I am really enjoying stamping with Lighthearted Leaves. Do you remember the last card I made with this new set? Pear Pizzazz, soft suede and burlap gave it a soft warm feel of rustic autumn leaves. Well this card is using the same stamp set but I added some rich, warm colors to my leaves and the feel is so much different. What do you think? I still kept the warm rustic feel with the kraft (crumb cake) card stock as the card base even though I have lots more color going on. The colors I used to stamp the leaves are Bermuda Bay, Pumpkin Pie, Old Olive and Rich Razzleberry. I used my blender pens to color in some of leaves but left lots of open space too. A little Rich Razzleberry coordinating ribbon with a double loop bow and a popped sentiment finished off this simple card. I think it turned out great! Thanks for taking a peek and hope your day is fabulous! 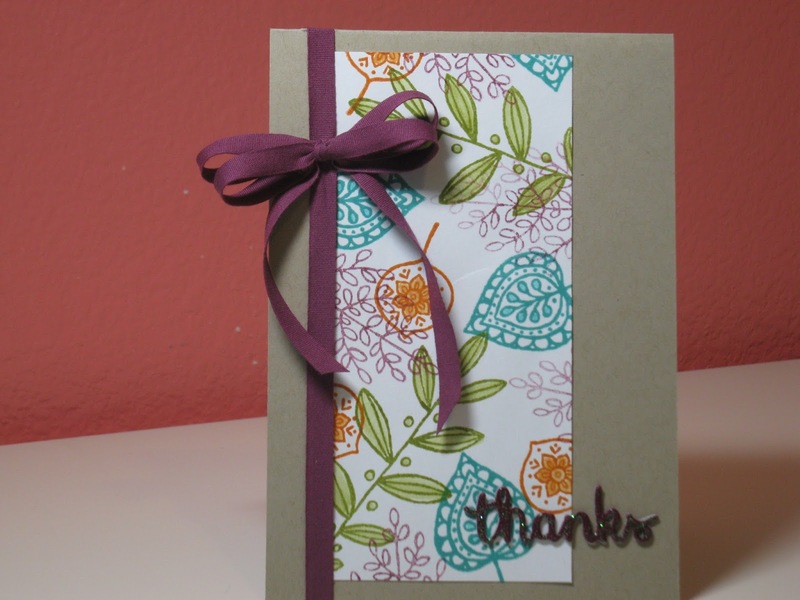 Click here to head to my Stampin'Up! store to do a little shopping!